Found this picture from flickr. Thanks to James Yeang for Stumbleupon this. hey the flight looks like upside down? 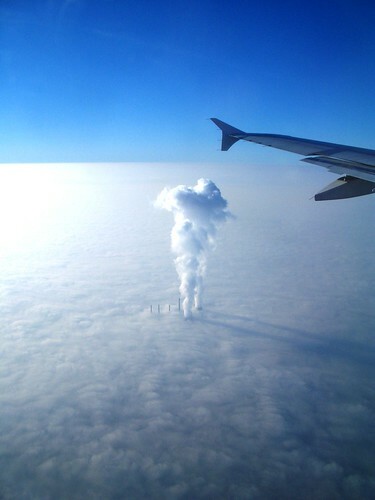 It is a really rare view in Malaysia’s sky (above the clouds) because we have a lot of big clouds and our factory not so tall like in the picture. Tall chimney theoritically is used because the smoke will not polute the air underneath the clouds but go into the jet stream. (I learned that in class).The photo is nice indeed. #Izzatz – Are you sure dude? #elvinado – Maybe that is the nuclear reactor tower. Not sure bro. #aMer – I don’t know either. Maybe the pic is fake or maybe it is true.